Business success has a lot to do with recognizing opportunities and maximizing opportunities. Yet, what many fail to realize – or forget – is that it’s possible (and wise!) to make opportunities as well. The idea that luck happens when preparation meets opportunity is as old as the Roman philosopher Seneca. And if being lucky simply means just that, then maybe we can game the system by being prepared for when that opportune time comes knocking at our door. 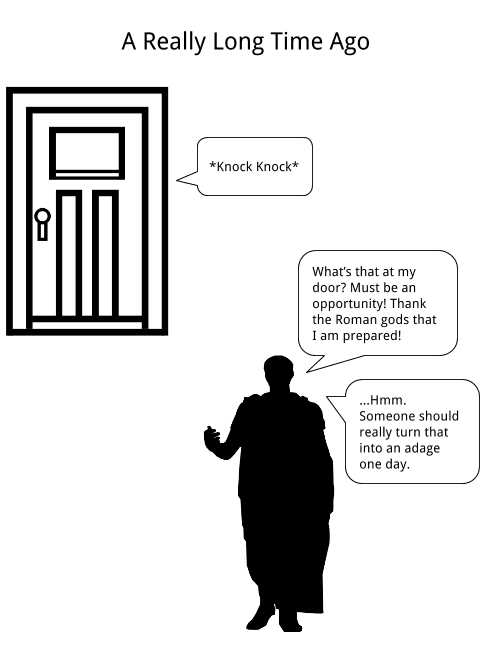 But what does being prepared mean? And what if opportunity eludes us like we are bearers of bad luck? To somebody who understands the price – and is willing to pay it – the answer is simple: Get to work. Preparation means keeping your eyes peeled, processing the information you have at the moment, and acting on your intuition based on that information. If you want to learn how to convert an idea into a business, you must keep your radar up. Noticing or creating chance opportunities and acting on them requires a keen awareness of your environment and of where the next wave of change is likely to strike. Additionally, you must be aware if that wave will be a tsunami of disruptive revolution that will wipe out all your previously held beliefs or society’s way of doing things. If you spot the wave of market change from afar – which you will if you scan the horizon every now and then – you will have enough time to get aboard and ride it. If you are far ahead of everyone else, you may even have enough time to fully develop surfing skills… so you don’t wipe out. By actively pursuing possibilities, you develop a different way of looking at things that puts you in a better position for a big life or career change. The economy tanked, and you were fired. If you’re open to the idea of starting anew (instead of sulking in the corner lamenting the loss of your lucrative job), then you can summon enough mental fortitude and physical energy to learn entrepreneurship and start a home-based business or become a productive citizen of an increasingly free agent nation. Others may view job loss as a sign of failure, but open-minded people believe adversity presents an opportunity to create something that is more aligned to their desires and beliefs. Finally, opportunities don’t necessarily book an appointment with the lucky ones. The lucky ones chase, if not create, opportunities by tapping into their optimism and converting belief into action. They understand that a positive outlook will only get them so far. It’s their actions – their persistence, doggedness, and unyielding determination – that will transform their vision into reality.